After two years of having to contend with broken windows, leaking roofs and ripped out seats, bus users in Oxford have finally won their battle for new shelters. Since 2007, residents using the seven stops along Marston Road have been asking Oxford City Council to replace the dilapidated shelters. Now, after two years, the council has agreed something needs to be done, and work to replace all the shelters has begun. 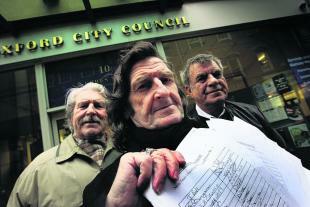 Community campaigner Mick Haines, 68, of Croft Road, wrote the first letter of complaint to the council. He said: “We are really happy about the news, the state of them is absolutely disgusting. “The thing is, a lot of older people use the shelters and they have nowhere to sit at the moment because the seats have been ripped out. The city council confirmed one stop along the road had already been replaced, two more are expected to be installed on April 1 and 2 and another four would be in place by next year. 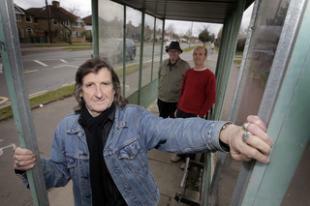 George Evans, 79, from Marston Road, said the bus stop he used, opposite Jack Straw’s Lane, had no seats left at all. He said: “I have to go up to the hospital quite a bit for appointments. At the moment I try not to use the bus because the stops are in such a state. “My wife and I prefer to ask my daughter to take us. The stops along the Marston Road are among 180 new-look shelters that will be installed across Oxford over a five year period. The new shelters, painted in traditional Oxford Blue, will be capable of carrying real time bus timetable information and will feature low-energy bulbs. City councillor John Tanner, board member for a cleaner, greener Oxford, said installation work should only take a day or two. He added: "I am thrilled that two more replacement bus shelters will be installed on Marston Road in April and even more next year. Hundreds of people who have campaigned to improve safety at an Oxford park have welcomed plans to install new lights. Almost 700 people signed a petition in July to get lights at Croft Road Park, Marston, and now Oxfordshire County Council has agreed to carry out the work when it puts in a new cycle lane. 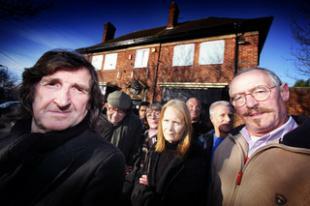 Croft Road resident Mick Haines, who organised the petition, is delighted. He said: “The park is unusable when the sun goes down. “People have started to avoid it after dark, and the new lights will also make it possible for the children living round here to use the street sports site in the park after dark. 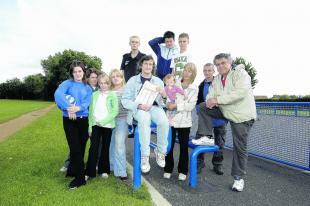 Jason Bright, 44, of Rippington Drive, was among residents who backed Mr Haine’s petition. He said: “I cycle to work in Oxford every day and go through Croft Road park to get to the cycle path across the University Parks. “I’m a pretty big guy, but I don’t like to go through the park after dark because I don’t feel safe. “I definitely wouldn’t have my kids playing over there. Mother-of-three Mary Ward, 43, of Lewell Avenue, said: “This will be great for next winter. “People go on about kids not doing enough exercise, but they can’t play football if they can’t see the ball. The county council has confirmed it will spend about £180,000 installing the cycle lane and lights, which will run along Rippington Drive, down Croft Road and along Purcell Road. The cycle route has been designed to link up with the existing cycle track which links the city centre and Marston across the University Parks. Work is expected to start in July. More than 500 people are fighting a controversial bid to build Oxford’s third Tesco store. The supermarket giant has submitted plans to build an Express store on the site of the boarded-up Friar pub in Marston Road. But in 10 days, 540 people have signed a petition against the proposed shop. They are worried it will undercut local traders and threaten the only post office in the area. Croft Road resident Mick Haines organised the petition at the beginning of the month and left it in the Costcutter store, which houses the post office and is directly opposite the site. He said: “There are all sorts of problems with building a Tesco in Marston Road. John Townsend, also of Croft Road, added: “It’s not just a post office, it is the heart of the community. Tesco, which has two other Oxford stores in Cowley Road and the Cowley Retail Park, bought the site from Oxford businessman Clinton Pugh last April. It has also purchased the site of another former pub, The Fox and Hounds, in Abingdon Road. That is also opposite a local supermarket and South Oxford’s remaining post office. Tesco wants to build Express stores at both sites. In December, it sent out consultation letters to 260 homeowners in the Marston Road area, and submitted plans for a two storey building, roughly the size of a tennis court, to Oxford City Council. Residents were asked to submit comments to the council by the start of this week. When plans to build the store were first announced, some residents gave it a cautious welcome. Nicola Bowers, of Marston Road, said she liked the fact it would be open later. Mr Haines said: “I know there are some in favour of Tesco coming to the road, as they assume it will be better value. A city council spokesman said a public meeting was expected to be called next month to give residents the chance to air their views about the application. Sivanesarajah Pakeerathan, manager of the Costcutter store, said he was pleasantly surprised by the support for the petition. Tesco said a door knocking campaign had shown that residents were in favour of the company’s proposals. Supermarket giant Tesco has divided residents’ opinion with its plans to build its third Oxford store in their community. Tesco bought the boarded-up Friar pub in Marston Road, Marston, from Oxford restaurateur Clinton Pugh in April this year, for an undisclosed fee. The supermarket chain has now sent out consultation letters to 260 homeowners in the area and submitted plans for a new Express store to Oxford City Council. The store would be 2,716 sq ft — about half the size of a tennis court. Bill Crumly, who lives in Marston Road opposite the pub , is among people who have received a consultation letter from Tesco. Mr Crumly, 72, said: “I’m worried there will be lots more lorries coming down here to make deliveries and it will make it more dangerous. Croft Road resident Mick Haines, 68, said: “I know a lot of people are in favour of this as they think Tesco will offer cheaper food, and with the credit crunch that is a big thing. Mr Haines was also worried about the effect a new Tesco could have on the business of the nearby Co-op and Costcutter. Doreen Walters, 64, of Old Marston Road, said: “I think there will be parking problems caused by this. However, there are residents that are strongly in favour of the store and say it will be good for the area. Tesco’s Express stores are the smallest type the company runs and are aimed more at convenience shopping. Its two other Oxford stores are in Cowley Road, East Oxford, and in the Oxford Retail Park, Cowley. Tesco corporate affairs manager Juliette Bishop said the consultation letters were followed up with house-to-house visits. She added: “We appreciate that there are some concerns locally about parking. “However, we have discussed this with the city council and believe the spaces allocated are sufficient for the store size. Anyone who wishes to comment on the development should contact the city council’s planning department.